When Species360 member uShaka Sea World stepped up to care for 253 Lesser Flamingo chicks rescued from drought-stricken Kamfers Dam in Southern Africa, staff veterinarians, keepers, and volunteers worked around the clock to help the fragile group survive. To help future teams benefit from what they learn, the team is using ZIMS to record condition, progress, and observations as they cared for the group. Here, uShaka Sea World shares some of their experience with Species360 member support lead Kim Larson. FROM uShaka Sea World: uShaka Sea World is proud to be in a position to offer a temporary home to some of the lesser flamingo chicks rescued by the Kimberley SPCA (Society for the Prevention of Cruelty to Animals) from the Kamfers Dam near Kimberley. 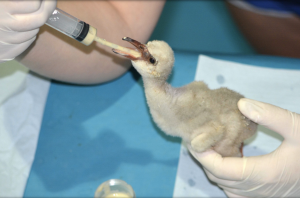 On the 27th January 2019, 253 flamingo chicks were flown from Kimberley to Durban before being driven to uShaka Sea World. On arrival they were assessed and grouped according to their weight and general condition. “It has been an intense week and I am most grateful to the staff and volunteers who have so ably and willingly assisted in caring for the flamingos,” said uShaka Sea World veterinarian Francois Lampen. Most of the uShaka Sea World flamingos are now entering, or well into their second week of life and spend time enjoying the sunshine, wading in water dishes and attempting to preen themselves. Occasionally one will even manage to stand boldly on one leg! Thank you uShaka Sea World for sending this update. For more information and photos, check out these Lesser Flamingo Rescue Updates at uShaka Sea World parent organization South African Association for Marine Biological Research (SAAMBRE).